Crime is down in Los Angeles-at least, on the surface. Mickey Cohen has been quiet since his release from prison and the LAPD has seemingly regained control of the city. But the underground is a different story. Det. Harvey Slater and company have spent the last two years focused on Domino and his Syndicate's unrelenting infiltration, but no matter how many people the hit squad kills, the real fight for Los Angeles rages on. Meanwhile, Slater's being hounded by Internal Affairs, Bonnie Brae is missing, and everything is falling apart at the seams. 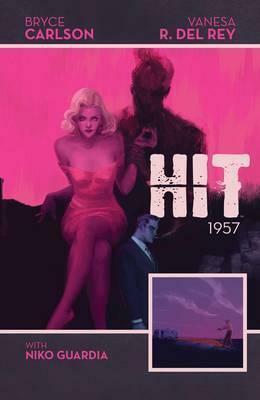 The next entry in the Harvey Award-nominated series, Hit: 1957 takes us later in the seminal decade of change for the LAPD-familiar faces, new threats, and more sharp, smart noir. Even if you missed out on the first series, if you're a fan of crime comics like Parker, Criminal, and Tumor, Hit: 1957 is in your wheelhouse. Bryce Carlson is the Managing Editor at BOOM! Studios, and has written for licensed properties such as Disney Pixar's WALL*E and Cartoon Network's ADVENTURE TIME. His first original comic book series HIT has debuted to much critical acclaim. A Southern California native, Carlson graduated from Chapman University's Dodge College of Film and Media Arts and now lives with his wife in Los Angeles.